WWE Champion, C.M. Punk, made a strong showing on last Monday's Raw in Philadelphia even with his WrestleMania opponent, Chris Jericho, appearing "via satellite." Punk also made an in ring appearance on last week's Smackdown. WrestleMania XXVIII is only six short days away and tonight’s Raw from Atlanta is the last chance to sell us on the biggest pay-per-view event of the year (although a surprising number of announcements have been coming on Smackdown). The last Raw before WrestleMania should be the best show of the year, at least until the night after WrestleMania which has it’s own history of making history. Before we get to tonight (and the one-hour documentary on the Rock and John Cena airing before Raw that no one was asking for), we have our last Warm Up before WrestleMania featuring a look back at last week’s show from Philadelphia. John Cena broke out his old theme music, basketball jersey, and pad lock for his rap routine shredding the Rock last week. 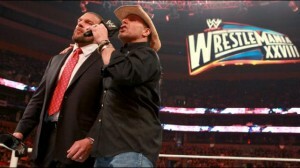 The two did not meet face to face, but after what they had to say it's highly likely they will tonight in Philadelphia. Obviously the big story coming out of last week’s Raw in Cleveland, Ohio, was the “John Cena rap versus the Rock’s concert” in the town that boasts the Rock and Roll Hall of Fame. While neither performer is headed for induction, the musical battle didn’t quite go down the way the promos gave the impression it would be and it was a blessing. 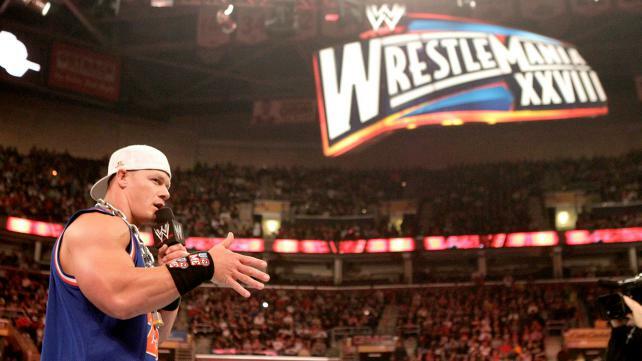 Most importantly, everyone got some air time with Cena and the Rock were limited to one segment each. As we head into tonight’s show in Philadelphia, Pennsylvania, expect a heavier focus on C.M. Punk and Chris Jericho and much clearer picture of the final names added to the card for WrestleMania XXVIII. Shawn Michaels shares the good news that he'll be the Special Guest Referee in Triple H's Hell in a Cell match with the Undertaker at WrestleMania XXVIII. Michaels will be a factor in the Undertaker maintaining his 19-0 undefeated streak at WrestleMania for a fourth straight year. As expected, last week’s Monday Night Raw from Boston dedicated a lot of time to the Rock and John Cena with their upcoming match at WrestleMania XXVIII. Thankfully both men were in attendance to move things along, unlike this week’s Warm Up at MLD where we’re wishing Brian best of luck in “all of his future endeavors.” We’ve brought our old friend “The Jason” up from developmental to get ready for tonight’s Raw in Cleveland, Ohio.